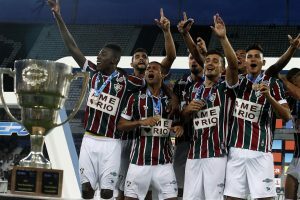 After a thrilling 3-3 draw in regulation time, Fluminense defeated Flamengo on penalties, 4-2, to win the first stage of the Carioca Campeonato. RIO DE JANEIRO, BRAZIL – On Sunday, March 5th, in a dramatic back-and-forth battle that saw five goals in the first half alone, leading to a 3-3 draw in regulation, Fluminense outlasted arch-rival Flamengo to win the 2017 Taça Guanabara on penalty kicks, 4-2. After a thrilling 3-3 draw in regulation, Fluminense defeated Flamengo on penalties, 4-2, to win the to Win 2017 Taça Guanabara, photo courtesy of Fluminense FC. With the win, Fluminense takes the first stage of the 2017 Campeonato Carioca and guarantees itself a spot in the tournament semi-finals. After a decision from Civil Court Judge Gilberto Clovis late Friday (March 3rd), both Flamengo and Fluminense fans were able to attend Sunday’s championship game, setting the stage for the classic matchup at Nilton Santos Stadium (Engenhão). Only five minutes after the opening whistle, Fluminense drew first blood with a remarkable counter-attack goal from Wellington Silva. Silva caught the rebound off a Diego shot attempt and sprinted almost the entire length of the field, beating one lone Flamengo defender, to knock the ball past Flamengo keeper Alex Muralha for the game’s first score. Flamengo would respond only four minutes later. Deep in Fluminense’s goal area, Flu’s Henrique Dourado attempted to kick the ball out of the area. But, it was intercepted by the waiting foot of Willian Arão, who easily knocked in the equalizer. This was the first goal surrendered by Fluminense in the entire Taça Guanabara tournament, and it would not be the last. At the 23rd minute, the Rubro-Negra would strike again. Paolo Guerrero’s header was adeptly blocked by Fluminense keeper Júlio César. But, unfortunately for César, the ball ricocheted right into the head of Everton, who smashed the ball back in over the fallen keeper to give Flamengo the 2-1 lead. 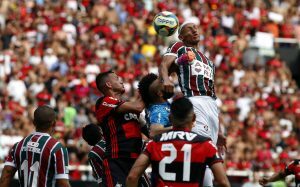 The game’s pivotal moment came in the 31st minute when, in Flamengo’s goal area, the ball hit the hand of Paolo Guerrero resulting in a penalty against Flamengo. Looking to redeem his earlier miscue, Dourado promptly cashed in on the penalty shot, to tie the game at 2-2. The intense matchup saw five goals in the first half and, thanks to Judge Gilberto Clovis, was able to be attended by fans of both teams, photo courtesy of Fluminense FC. As the action-packed first half was coming to a close, Fluminense would add to its lead when Silva set up Lucas with a perfect pass, leading the defender right into Flamengo’s goal area. With Muralha back on his heels, Lucas was able to take advantage and score to give Fluminense the 3-2 lead going into the halftime break. It was a tale of two halves as, following the first half’s offensive explosion, both teams’ defenses took center stage in the second half. Nearly forty minutes into the period and neither club was able to get on the scoreboard. Finally, at the 84th minute, Flamengo broke through off a beautiful Guerrero free kick that sailed past the leaping wall of Fluminense defenders. César could only watch helplessly as the ball flew into the net to tie the game at 3-3 and send the match to penalty shots. The teams traded penalty shot scores until 2-2, when César, taking advantage of every inch of his 6’3″ frame, was able to use his outstretched toes to block a Réver shot. Unfortunately, for Nação Rubro-Negra, Muralha could not equal César’s feat as Marquinhos scored to put Fluminense ahead 3-2. With the pressure on, Flamengo’s Rafael Vaz’s shot sailed wide, putting the fate of the match squarely at the feet of Flu’s Marcos Júnior. The 24-year-old calmly stepped up to the ball and shot a rocket past a diving Muralha to give Fluminense the game and the 2017 Taça Guanabara title. Sunday’s classic had been marked with controversy throughout the week leading up to the match. On Wednesday, March 1st, it was announced that the match would have to be held at Engenhão due to Maracanã Stadium’s disrepair and abandonment. Also, until Judge Clovis’ order on Friday, only Fluminense fans were permitted to attend the game due to a new regulation that limits attendance of matches between Rio’s big four clubs to only one fan base. As Fluminense now celebrates its victory and guaranteed spot in the Campeonato Carioca semi-finals, the club now turns its attention to the Copa do Brasil where the club will play Criciúma, from Santa Catarina, on Thursday, March 9th. Meanwhile, Flamengo prepares next for the Copa Libertadores, where the team will face Argentinian club San Lorenzo on Wednesday, March 8th. A sold-out crowd is expected for that match, which will also be the Rubro-Negra‘s much-heralded return to Maracanã Stadium. Both teams can also look forward to the second phase of the Campeonato Carioca, the Taça Rio, which begins its first round of games on March 9th.